This is Joanna's story. The story of how she hates her life and everything seems to be falling apart all at once. Then a star falls and everything changes. Everything she hated about her life no longer exists and maybe things are going to be better now. The only other person who knows what's going on is James, the strange boy that comes to her rescue time and time again. But he's not just a boy - there's something different about him and Joanna suspects he may be the one behind all the strangeness. Joanna tries very hard to adapt to her new life and realizes she's missing all the things she thought she hated. She's very confused and not sure what she will be able to do to fix it all. This was a sweet book, but I was never fully dragged into the story. Joanna didn't click with me for some reason - even though she was a volleyball star which was something different in a book. James was a little too fake for me, even though I'm sure some of it was intentional. I enjoyed the way the author hit you over the head with the message in a way that I didn't even realize she was doing it! That takes some skill. Overall, a good story with good characters. It just wasn't quite up my alley. Hi Jasmyn! 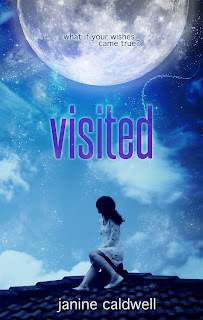 Thanks for taking the time to review Visited! I also have my very own fan group on Goodreads that I would love for you to join!